Luca Di Angelo (Testi) is a Naples-based cigarette smuggler. He and his smuggling buddies ride their speedboats up and down the Italian waterways to deliver the goods, but it’s never anything really harmful like drugs. Luca has a wife and young son, and doesn’t want to jeopardize their lives. Things turn deadly serious when a French drug kingpin, known as The Marsigliese (Bozzuffi) decides he wants to move into the Italian territory, with hard drugs and all. Being a sadistic torturer, he murders, tortures, disfigures or mutilates anyone who gets in his way. When his wife Adele (Monti) is kidnapped, the normally mild-mannered Luca goes on a rampage of revenge the likes of which Naples has never seen. Will Luca get out alive? While not, strictly speaking, a Poliziotteschi (because the role of the police is pretty limited and it’s not a procedural), director Fulci has crafted some kind of cross between the crime films prevalent at the time, and the gore films he is most known for these days. It’s all beautifully shot by cinematographer/master Sergio Salvati, and the make-up effects brilliantly done by artist/master Franco Di Girolamo and his team, and the music is stellar as well, done by the great Fabio Frizzi. These men and others help make Contraband a very well-made and entertaining movie. But it’s not for everyone. Anyone who reads this site will surely love it, but the level of violence is definitely over the top - in an awesome way, of course. You have to transport yourself back to 1980 - while characters are playing Pong and going to the discotheque (while wearing some amazing clothing), they also are being subjected to what had to have been new heights (or depths, depending on your outlook) of blood, guts, and gore. Even today with our jaded and experienced eyes, it’s powerful - imagine what they thought back then? There’s other things that presage the oncoming 80’s as well, such as the sax on the soundtrack, a couple of blow-ups and fights, and a kid with the time-honored bowl haircut. Fabio Testi is charismatic and likable, and he has a truly amazing fur coat at one point. 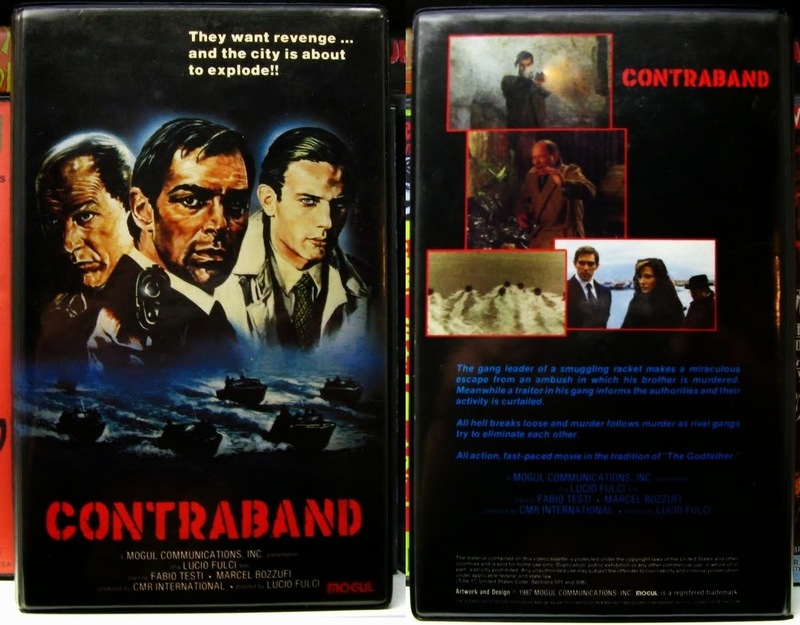 Thankfully, Contraband was made long before political correctness. But besides all that, it’s just a good, solid movie, well-made on all fronts. Fulci was truly a maestro and this is one of the feathers in his cap. He was undoubtedly a man ahead of his time, yet firmly rooted in the traditions of the past. The way he marries the two is an example of his no-rules genius. Look for him in a tiny cameo at the very end of the movie as one of the shooters. The Blue Underground DVD is excellent, although it would have been nice to have an Italian track with subtitles, instead of a no-options dubbed version. But that’s a minor quibble, as this fine film is well worth owning. Contraband is just great. If you haven’t already, we definitely recommend purchasing the DVD. Also check out a write-up from our buddy, A Hero Never Dies! I think it was either this, or The Big Racket that introduced me to Eurocrime way back in the day. I've seen way over a hundred films (maybe closer to 200 but I stopped counting long ago) in this genre and there are few that manage to reach the heights of this in terms of the violence stakes. Some excellent squibs too. It incidentally revisits a number of themes from Lucio's debut comedy I ladri (the theives). That had smugglers too and also dealt with the corrupting influence of outsiders who upset the natural order in which "good" local criminals can be justified but outsiders are simply brutal or greedy. Indeed the influence of outsiders comes up time and again in his work, in Don't Torture A Duckling outsiders were shown as liberal and progressive as opposed to the small c conservatism and knee-jerk superstition of the locals. Maybe the clue to why this theme is recurring is in one of Lucio's early works- the screenplay he wrote for An American in Rome. This was in the period, I believe, when he understudied to Steno. During this period Marxism has a massive influence on film theory in post-fascist Italy and especially the works of Gramsci. So I take these films as an expressions of Lucio's view on what was termed hegemony (and what I believe later came to be known as cultural imperialism). Eurocrime film was often, after all, expressions of left leaning criticism of the system albeit sometimes even using the iconography of the right- such as the vigilante or the strong-man cop. Carlo Lizzani an early Eurocrime director was a communist, DiLeo was on the left, Petri too, as was Damiani and Lenzi is/was an anarchist. Lucio I believe described himself as a Marxist. So this would certainly have influenced his sole crime film. That's how I see the film anyhow. Banned in Germany, so i bought it in Austria. 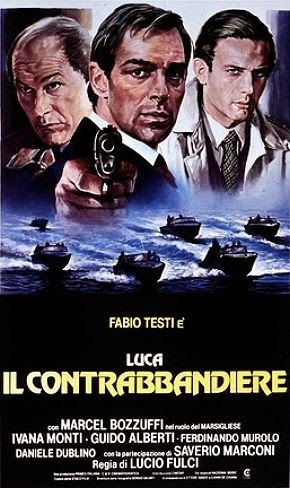 One of my favorite Italian Crime movies. Nigel: Thank you for your detailed thoughts. We appreciate you taking the time and our we're sure our readers do as well. Great info. Harry: Definitely one of the best. Haha, take that Germany censorship. You got another way.